Turtle Bay is a private residence designed by acclaimed architect Hugh Stubbins while studying under organic architect Frank Lloyd Wright, known for designing buildings in aesthetic harmony with the natural world. Recover designed and installed a sedum green roof over an existing car port to transform the homeowners' view from the kitchen. 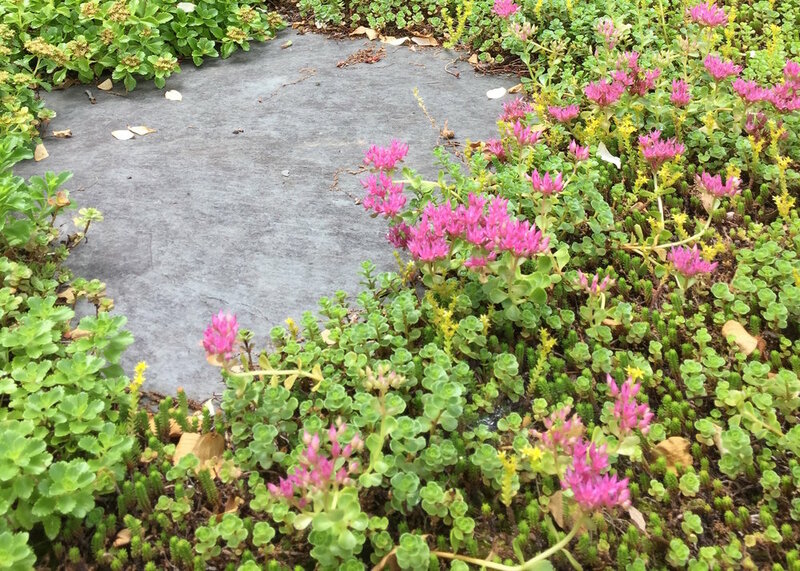 Recover installed a ZinCo extensive green roof over a new EPDM membrane and planted a variety of sedum cuttings. A mix of native volunteer flora, including several species of moss, have diversified the roof over time. Slate field stones from on-site materials create a distinctive walking path across the roof, making space to enjoy views of the Connecticut River and surrounding woodlands. Before: EPDM membrane view from the kitchen. In process: sedum cuttings being planted, with kitchen windows in background.